Weather in Bali in Winter. My trip to Bali in December & Week of Rain?! What comes to your mind when someone says “Bali”? Magical retreats, infinity pool, instagrammable swings and birds nests. Is Bali really like that? Is Bali really worth the hype? Read this post to find out more plus to find out whether it’s worth to go to Bali in December and what to do if you’re stuck with a week of rain and no intention to sit in the hotel! I wrote this post in 2016, however, as I always do with my posts, I updated it in 2019 to make it more relevant for you! Imagine being one week in Bali in winter (our winter and their summer, as Bali is in the Southern Hemisphere)? What comes to your mind? White sandy beaches and honeymoon paradise? Then look up for some photos in Google… What do you see? Amazing jungle, paradise beaches, infinity pools, Instagram paraside! Yes, exactly, my expectations before the trip were very high. But… when we actually got to Bali, I got slightly disappointed. Don’t get me wrong, I first went to Bali in 2013 and Instagram wasn’t so popular yet. Blogs weren’t popular. There wasn’t that much information about Bali at all and I thought Bali was all about swimming in the amazing ocean. I thought Bali was the same as the Maldives. While it’s definitely NOT the same and below I will tell you WHY. Read this post about my experience in the Maldives. While I did enjoy many things in Bali, there were also quite a few things that I didn’t like and didn’t enjoy, so, ladies and gentlemen, here’s what to expect from Bali. Pros and cons of Bali: what to expect from Bali? Is it worth the hype? As I mentioned a couple of times, I went to Bali in December. It’s one of the highest seasons in Bali because of the Christmas holidays, school vacations and because of the fact that it’s cold in most parts of Europe and North America, so people tend to escape the cold and head South to enjoy the sunshine. Chances are, you won’t enjoy sunshine in Bali in December. You won’t even see it. Of course, it’s never certain with the tropical destinations, but Bali is usually pretty rainy in winter (our winter) – December and January are the months with a lot of rainfall in Bali and it’s not just rain that lasts 15 minutes, no, it will be raining days and nights! Well, to be completely honest with you, I did see the sun once or twice during a full week in Bali, but there was only one day without any rain whatsoever. 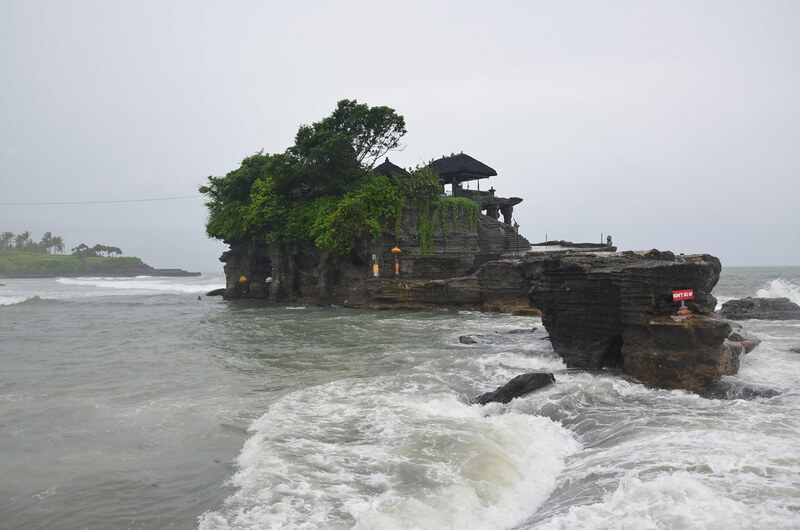 Though honestly, Bali, doesn’t lose much because of the rain, it still looked beautiful and unique because it’s not a white-sandy-beach paradise. Bali is all about visiting thousands of temples, coffee, and rice plantations and jungles, practicing yoga, visiting spas and retreats. The problem is, I wanted a holiday on the beach: you know, a typical beautiful resort on the beach, but I picked a wrong destination. Together with my friend, we rented a hotel in Sanur. Sanur is a popular place with many hotels and more or less okay beaches, though some people say it's boring. The water in the ocean didn’t look very clean - that’s why we didn’t swim much (not mentioning the rain and hours spent in traffic jams - later about that). However, our hotel, Oasis Lagoon Sanur, was actually great! It's one of these beautiful Instagrammable hotels and we had a swimming pool right at our door (it was, for some reason, ice cold, but looked beautiful). Our hotel had its private beach, which, however, was 15 minutes away. The breakfasts were okay but at the same time a little bit odd for the western taste. But I guess having fish soup, rice, and fried noodles for breakfast is a thing in Bali even though there were no locals at this hotel. Since we had 7 days in Bali in December, we wanted to see as much as possible. Even though our budget wasn’t really very high (around 300-400$ for a week per person), we managed to do a lot of things. Well, we tried, but we spent at least 3 hours per day in the traffic jams and once we spent 7 hours stuck in a car in the traffic jam and it wasn't great, as you can imagine. Traffic is a huge problem in Bali, it's even worse than in Mexico City, Moscow or Bogota. You might think that Bali is a small island, but a) it's not small, b) the population is 4.2 Million people! Plus a million influencers residing in Bali. Many people suggest renting a motorbike instead, but I'm terrible at driving, so this wasn't an option. Saying no to a street vendor is often not respected and doesn't mean anything to him. I've been grabbed and touched so many times, that I stopped counting. I really don't like when people get touchy, especially some random vendors you don't know, so that's something you might not like either if you're same as me. Also, try to avoid scams (there are many) and always try to bargain, because tourists are often being severely overcharged. Nowhere as bad as in India though - read my posts about how to avoid scams in India. As I mentioned above, Bali is a massive island and some landmarks are located in the "middle of nowhere". Your options are: buying a tour (check the prices and availability of the tours in Bali), hiring a taxi for a day or renting a motorbike. You choose. Ta-dam, it's time for the pros. Why is Bali worth visiting? I've travelled to 77 countries and haven't seen anything like Bali just yet. That makes it pretty unique. 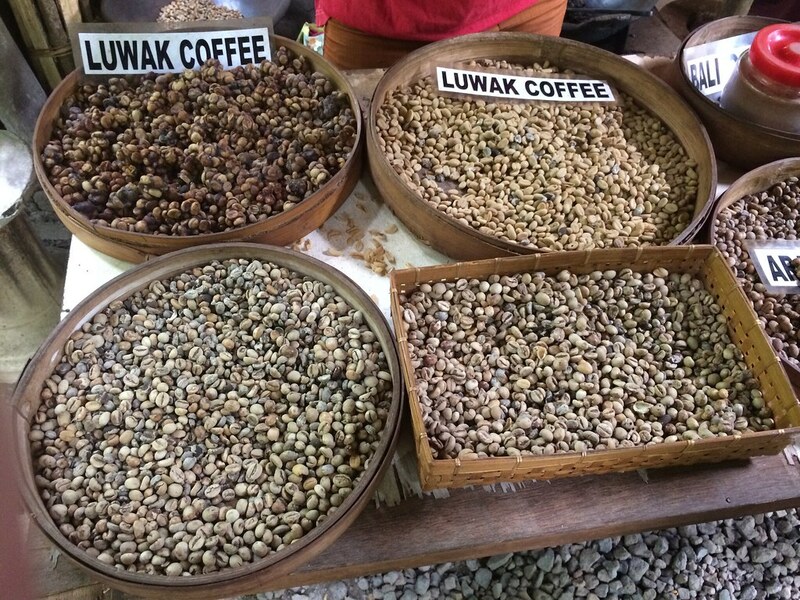 Jungles, beaches, history, interesting food and amazing coffee - Bali is great. To see the best photo locations and spots in Bali, head to this post (that I yet have to finish) - where you will find the most complete blogger's guide to Bali! If you like partying - Bali is a place to go. Kuta really gets crazy at night. Where else can you rent an amazing villa in the middle of the jungle for less than $100 per night? Bali is also an amazing place for yoga retreats, girls retreats and relaxation in general. If you're wondering what to do in Bali when it rains, well, you can do all these things we've done, because it was raining all the time! 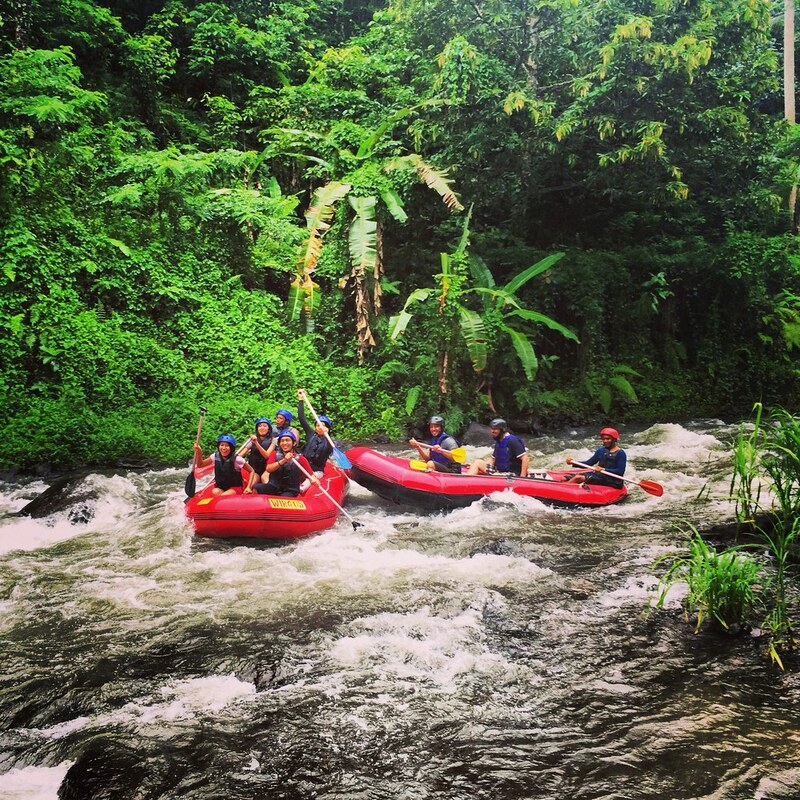 First of all, you can go rafting when it rains in Bali! That’s probably the coolest thing you can do in Bali in December. (Well, if you aren’t a surfer, of course). However, it might be a little bit too extreme for some people. 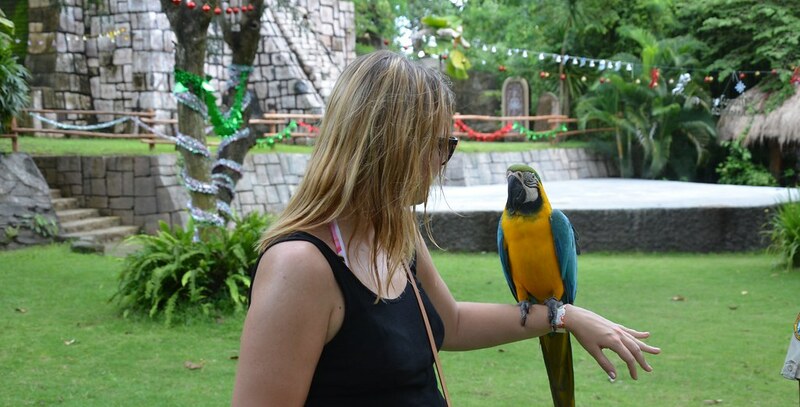 The safari park is mostly tailored for the families with little kids (this is nothing like an actual safari in Africa - read here about my experience), but we did enjoy a couple of attractions and, of course, the parrots! We hired a taxi to experience the nightlife in Kuta. The place was really crazy. Everybody on the street was offering us drugs and it was pretty annoying and unacceptable for me. That also means there is a huge market for drugs on Kuta, which is kind of sad. However, there are some really fun places to emjoy the nightlife in Kuta and, come on, you have to see it at least once. Besides, when you're indoors, the rain doesn't matter. For the rest of the days, we hired a driver to drive us around Bali and show us the most famous and interesting spots. It was really raining a lot and we had been stuck in traffic probably 30% of the time we had assigned for sightseeing but we still managed to see a lot. We went to Ubud (rice terraces were pretty amazing) as well as the temple full of monkeys. 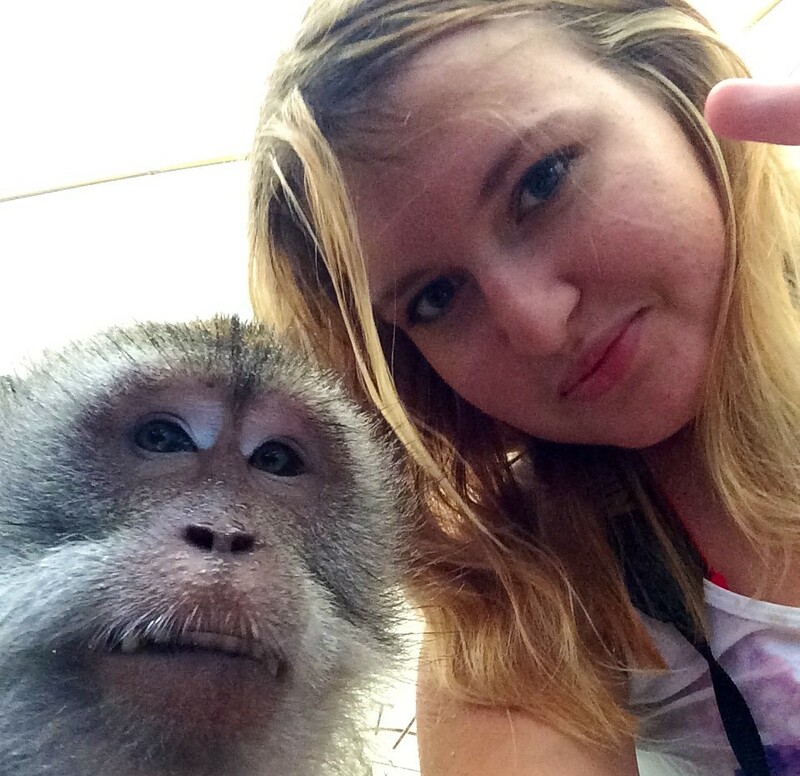 Monkeys were quite aggressive but I still managed to snap a selfie with one of them. On one of the 1.5 sunny days, we went to Uluwatu, which was absolutely gorgeous. 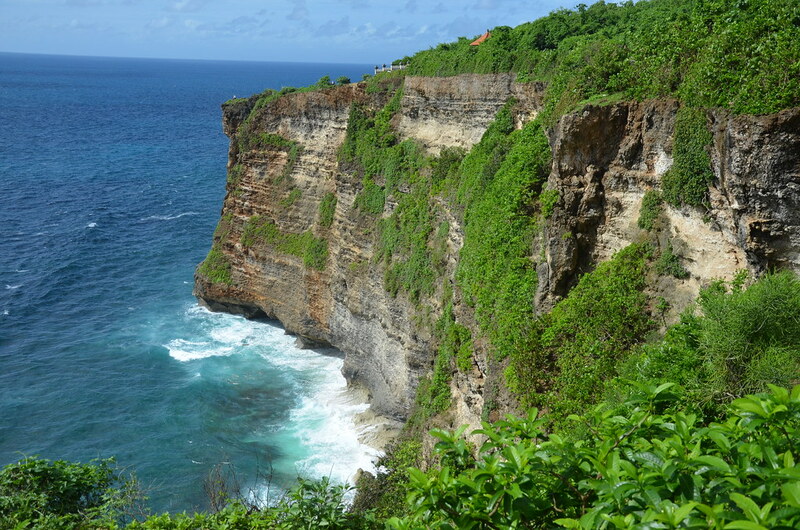 But Uluwatu is only great for a sunny day, but it's so beautiful that I had to share it in this post. Sorry. Summary of Bali in December: things to do + is Bali worth the hype? To summarise, I must admit that Bali is unique and not similar to anything I’ve seen before. However, I was really disappointed by the weather in Bali in December: when it rains, it rains heavily it might ruin your plans. If you're planning the trip to Bali as a beach vacation, it's better to go during another season. Also, Bali in December is very crowded and has terrible traffic problems: be ready to stay up to 2-3 hours in a traffic jam. But you already know all that because I told it in the pros and cons of Bali and there's no need to repeat it. Thanks for this refreshing review, Liza! I too seem to hear people gushing about Bali all the time and it’s nice to hear a different, more honest perspective. I was in Bali in December, 1993. I had all my money stolen the night I arrived. I stayed in a little hut on the beach on Nusa Lembongan for $6 per night (including breakfast!) and a cyclone ripped the roof off the hut on xmas night. It was one of the most amazing travel experiences I’ve had. I loved it!! And I’ll be writing a post about it (eventually!) But the real Bali disappeared long ago, sadly. I am currently in Bali (in Ubud, but I also explored a little bit of the southern beach-y areas). I guess I got lucky because it hasn’t rained very much while I’ve been here! Only one day was completely rained out, but mostly it rains for a few hours or overnight or something. Good for you for doing all of those activities despite the rain! Sorry you didn’t find Bali to be more enjoyable! You’re right about the traffic, it’s not super easy to get from place to place. I went to a very nice beach in Canggu, though! First of all if you are going to Bali for the beautiful beaches you do not go to Sanur! Sanur has a reef off it so there is very little wave action. Also, most of the boats going out to the islands leave from Sanur Beach. Then as you said it is the rainy season. It is called that because it rains a lot during that time so to go there and not expect it to rain doesn’t make sense. There are beautiful beaches, people, temples, and culture to be enjoyed. You just need to do more research before you go to be sure you go at the best time for the weather and the best places for beach time. I lived in Indonesia for 14 years. There is everything beautiful in Bali for you to enjoy. Nice and honest opinion. I’ve been living in Bali since 2007 and yes, December (and July) is peak season. Streets are crowded by buses, rental cars and of course motorbikes. I am as a local also annoyed when peak season comes but Bali makes money from these seasons. So, yes…dont come in December and July. I personally usually dont travel on high season as there will be to many tourists. Beaches – go to south. less tourists and white sand. lots of hidden beaches in south area, but you have to be lil more adventurous as not many people know. talking to surfers who stay in south area like Pecatu, Ungasan, Balangan, Bingin area would help to find the hidden beaches. Sorry to hear that you did not enjoy your Bali trip.